There are generally considered to be two types of SEO – On-page optimisation and off-page optimisation, the first part of this Free SEO Advice fact sheet concentrates primarily on On-page optimisation. This is what I consider to be the number 1 piece of advice every SEO should share with clients. Far too many SEO companies take on SEO work when the keywords are totally unrealistic and unachievable on the budget provided. The SEO company don’t care, they still get paid even though they know the targets are unreachable. Keyword Research / Competitor Analysis. On a par, and related to, realistic expectations keyword research and competitor analysis is crucial before any SEO campaign is started. Knowing which keywords and phrases to target with your SEO campaigns before you start is a must, not only knowing which keywords can potentially generate good traffic, but also knowing which keywords are realistic for you to target and which don’t have competitors targeting them who you can not realistically beat. Good keyword research and competitor analysis before starting an SEO campaign will pay you dividends and also save you money spent on targeting keywords that will never give you a good ROI. It’s important to realise that each page on your website should be optimised as an individual page, but then structured in a way that all pages are bonded together in a search engine friendly way. A common mistake made, is that people just a use default titles and meta descriptions throughout their website rather than providing individual titles for each page relevant to the content on the page. When constructing a website the structural mark-up and navigation system plays a key role in search engine optimisation. A good rule of thumb is to imagine Google being a small child when setting out your site. Use your navigation system to tell Google where to go, tell Google where it is going and tell Google where it is when it gets there. This is achieved by having a very simple, clear navigation system and by using the correct anchor text in links pointing to pages and the correct titles and content on the pages when it gets there. It is important that Google doesn’t get lost in your navigation and can quickly and easily find it’s way to any page on your site that it wants to find, just like a small child on its first day at a new school. OK you have your navigation and structural mark-up nice and clear, Google has followed a link to a page using Free SEO Advice as the anchor text, it expects the page to be about Free SEO Advice so give it what it expects. First tell Google it is on a Free SEO Advice page by having Free SEO Advice in the page title, do the same with a main header, provide content about Free SEO Advice and an image of Free SEO Advice using Free SEO Advice as the alt attribute. Unlike the above section where I say treat Google like a small child when constructing your navigation system, once Google is reading your content treat it as a mature person, don’t give it content written for a search engine with keyword stuffed pages, give it natural well written creative content. Creative being the keyword, a good SEO copywriter will provide content that reads naturally but still gets your keywords and phrases in the right places. As mentioned previously, a page is a page and each page should be different. Google doesn’t like duplicate content and if you have generic text on all your pages it is important that there is a high percentage of unique content on all your important pages, this can sometime be a problem with template based websites which use a standard header, footer and sidebar throughout the site. A good way of overcoming this is to have different templates for product pages which although look exactly the same, have different (or reduced) content in the header footer and sidebar and which give far more prominence to the main content section of the page. 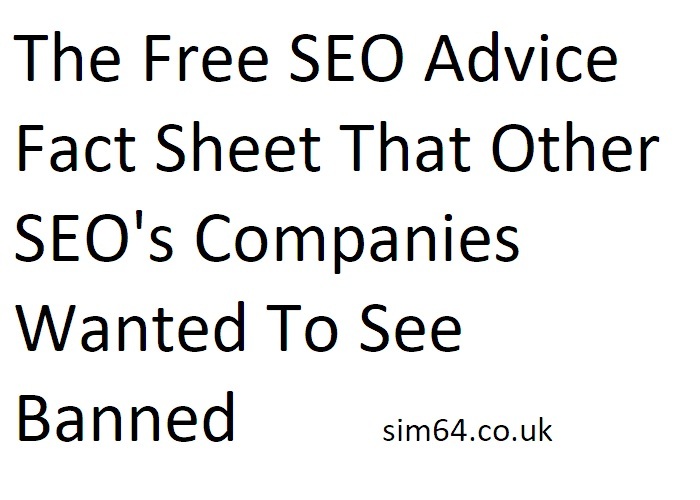 Here it is, The Free SEO Advice fact sheet that SEO companies want to see banned. We are not saying follow this SEO Advice and you will miraculously suddenly appear on the front page of Google, but that by following the SEO Advice provided here it will set the foundations for your SEO campaign and will give you a far better understanding in the process of SEO and in many cases make you more knowledgeable than the countless SEO charlatans who have jumped on the bandwagon in recent years who exploit small business owners with unrealistic promises. OK you have your navigation and structural mark-up nice and clear, Google has followed a link to a page using Blue Widgets as the anchor text, it expects the page to be about Blue Widgets so give it what it expects. First tell Google it is on a Blue Widgets page by having Blue Widgets in the page title, do the same with a main header, provide content about Blue Widgets and an image of Blue Widgets using Blue Widgets as the alt attribute. More Free SEO Advice coming later – Let’s help each other. This Free SEO Advice fact sheet is work in progress and can also be used as a SEO questions and answers page. If you have any questions related to SEO you would like me to answer please use the comment form below. and I will do my best to reply with an honest answer. Equally, if you are an SEO specialist who doesn’t mind helping out small business owners, please feel free to share any SEO advice or tips you have with everyone who reads this.